La Vaca Argentina - Numancia is a modern restaurant offering Argentinian cuisine. The average price of a 3-course meal at the La Vaca Argentina - Numancia restaurant is 35 euros. Note that although GoMadrid.com strives to maintain all information about La Vaca Argentina - Numancia up to date, the prices mentioned are only an indication and may not reflect the exact value of your meal. Located near the residential area of Puerta del Hierro and the Dehesa de la Villa park, to the northwest of central Madrid, you will find this cute restaurant serving the best from Argentina and seasonal chef's specials which are a delight for those in the know. An indoor saloon with capacity of around 50 guests plus two glass terraces that open all year and can host private parties for up to 25, surely you will find here a place for your most relaxed evenings. 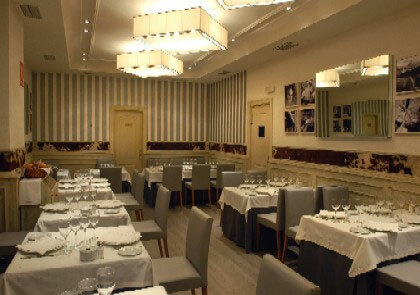 The address of the La Vaca Argentina - Numancia restaurant is: Numancia, 2, 28039 Madrid. The nearest Metro station is Francos Rodríguez. Please see the La Vaca Argentina - Numancia restaurant location map below.